Mainly made of high strength aviation aluminum alloy, forging not only lightweight & stability of the tube, but also elegance & individuality. Max. load capacity is up to 5kg. 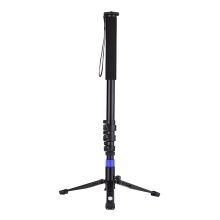 The monopod keeps your camera or camcorder stable during your photography and shooting. Universal mounting plate, with reversible 1/4 & 3/8 inch screw, is matched to a variety of ball head as well as any professional camera and DSLR cameras, which can be directly installed. Flexible flip lock design (4-section extension), its working height can be easily adjusted from 69cm to 170cm. Folded height is only 68cm. Starting with the roughest tube is highly suggested as to optimize stability. The foldable metal unipod holder supports the monopod and allows it achieve 360° rotation freely at a gentle inclination to ensure multi-angle shooting and low angle shooting of your device. The max. tube diameter is 32mm, giving it exceptional strength for heavy duty work. Considerable waist strap design, convenient to carry and improve the stability. Comfortable sponge wrapped on its upper part, warm in winter, anti-slip in summer.